« The last Turkey recipe … for a while! This tasted way too good to be this healthy but it’s true and we have the calorie count to prove it (286 if anyone’s interested). Can all be thrown together in 15 minutes tops which is great on a week night. Mix the peanut butter, chilli sauce, 100ml water and soy sauce to make a smooth satay sauce (it will look a bit gross but don’t panic it works in the end). Put the noodles in a bowl and pour boiling water over them, stir to separate and drain. Heat the oil in a wok, then stir-fry ginger and the harder bits of veg for 2 minutes. Add the noodles and the rest of the vegetables and stir-fry on a high heat for another minute or two or until just cooked. 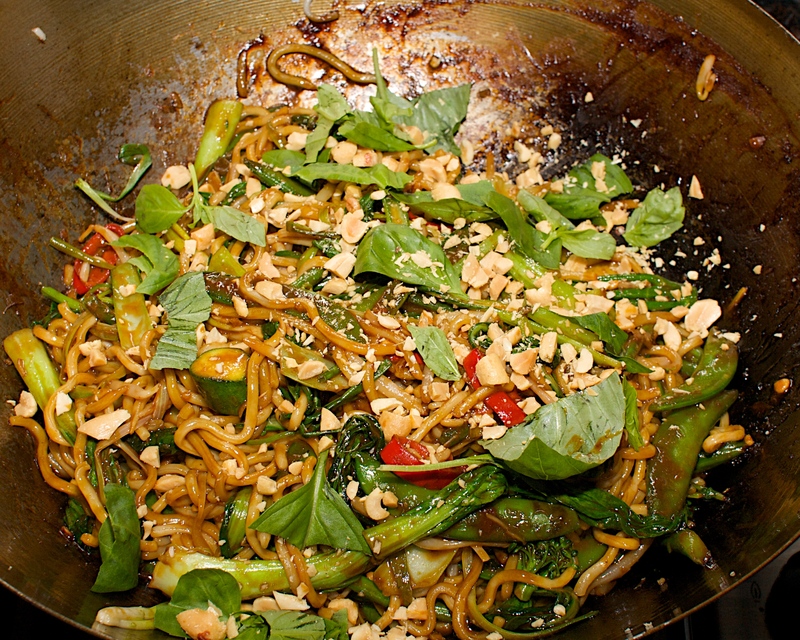 Push the veg and noodles to one side of the pan and pour the sauce into the other side, tilting the wok. Bring the sauce to boil and then mix everything together. Sprinkle basil and peanuts over to serve. Eat and then lick the bowl. Original recipe from BBC Good Food.